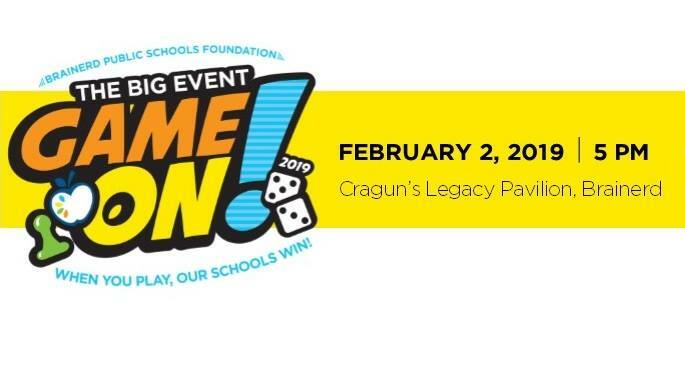 On behalf of the Brainerd Public School Foundation, we are very excited to announce The Big Event, a celebration of the Brainerd Public Schools Foundation that will be held on Saturday, February 2nd, 2019 at the Legacy Pavilion. This is a volunteer organized event to celebrate our public schools and raise funds for the Brainerd Public Schools Foundation (BPSF). This year’s game on-themed fundraiser is another anticipated SELL-OUT EVENT, with 300+ attendees in our sixth year. The Big Event appeals to local residents as well as people from outside the area as the Brainerd alumni reach goes quite far. GAME ON! WHEN YOU PLAY, OUR SCHOOLS WIN! We invite our VIP guests to arrive for the 5pm VIP Gamers Lounge and the General Admission folks are invited to join the fun starting at 5:30pm. During our VIP Social Hour you can browse through the SILENT AUCTION tables, join in on the RAFFLES, play some GAMES – including a horse race and BPSF custom scratch-off tickets while checking out our 4A GRANT DEMONSTRATIONS! The live musical talents of BHS Student Danny Olson (from the group SOLO) can be enjoyed during social hour. A delicious meal with dessert will be served about 7pm. Program and trivia to follow. Keep the fun going when you join us in the Legacy Grille for the Winners Lounge After-Party with live music from Dave Burkart. The online auction will open at 10am on Tuesday, January 29th and will close at 8:30pm on Saturday, February 2, 2019.